Have you seen this lovely work of art by Eleanor Gilpatrick of the New York Festival market on 1000 Markets? Eleanor Gilpatrick's painting reminds me of sitting in an Upstate New York country house on a summer's day with a gentle breeze coming through the windows as the curtains sway. 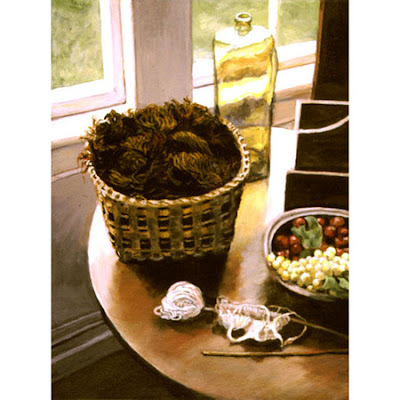 The still life is actually based on a display the artist came across at The Mulford House on the Mulford Farm property in East Hampton, New York. This is listed in The National Register of Historic Places. The house was built in 1680 and hasn't changed much at all since 1750. I've not been to this property, but Eleanor's piece tells me a story about it with a single glance.